[UPDATED below 6/6/17] An award can be described as a prize or mark of recognition in honor of some real achievement. At least, that is what most people think of as an award. 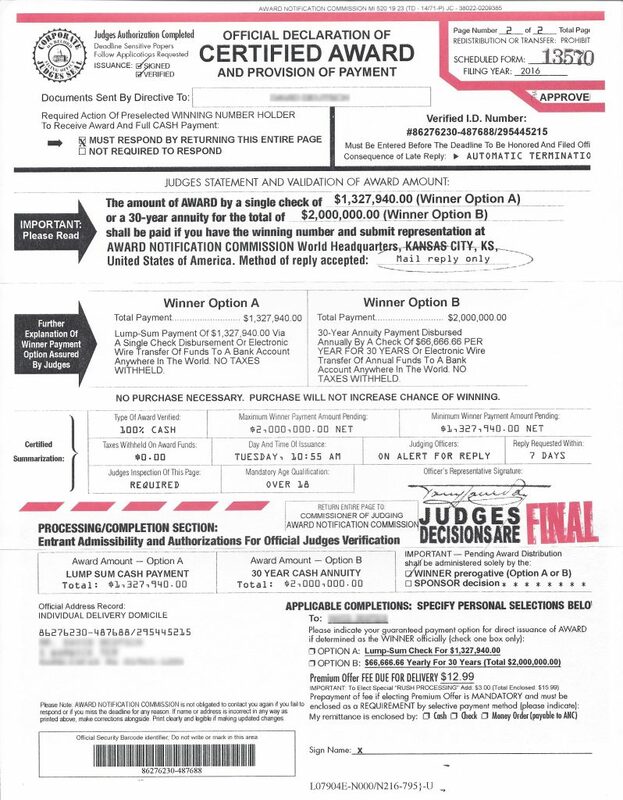 We sometimes hear from readers who send us “award” notices that feel more like scams to them or clever marketing manipulation tricks than actual awards. We’re not referring to the malicious tricks of Internet criminals or liars of dubious intent. We’re talking about that gray zone occupied by clever shysters who use deceptive, but legal practices to make money through “awards” they present to someone or some organization. Are these scams? 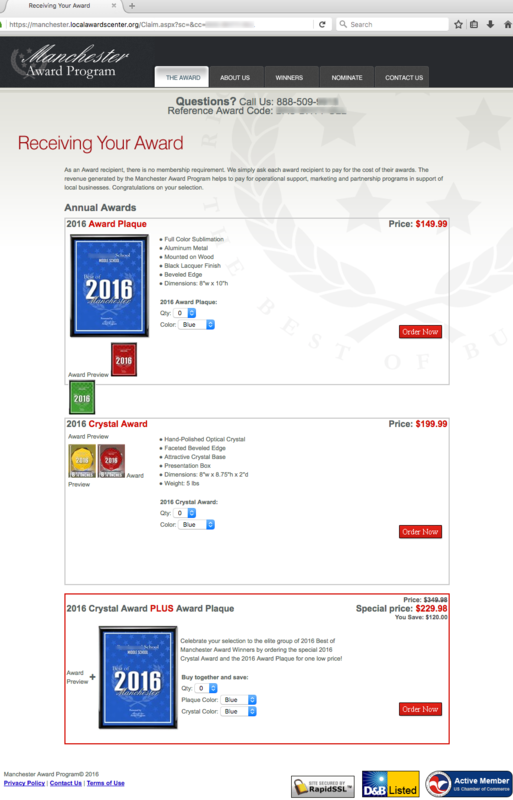 We present two very different “awards” below and you can decide for yourself. On November 14, a school in Manchester-by-the-Sea, Massachusetts received two similar emails sent to two different employees… “[SCHOOL NAME REMOVED] School has been selected for the 2016 Best of Manchester Awards for Middle School” and “[SCHOOL NAME REMOVED] School Alumni/Ae has been selected for the 2016 Best of Manchester-by-the-Sea Awards for Elementary School.” While the first email came from info @localawardi.com, the second email came from info @system-award.com but both were signed “Best Regards” by the Manchester Business Recognition or Manchester-by-the-Sea Business Recognition. (So far as we can find, there is no official Manchester Business Recognition.) If you’ll look at both of these emails it will be crystal clear that they came from the same sender 2 seconds apart. Readers may wonder why we might question the honor of bestowing an award to any school. So, let’s dig a little deeper. On the surface it may appear that this school has been selected twice for an honor or special recognition, first as “2016 best of” Middle School and then as a “2016 best of” Elementary School. However, Manchester-by-the-Sea is a very small town in Massachusetts with only one public and two smaller private middle and elementary schools in the entire town. 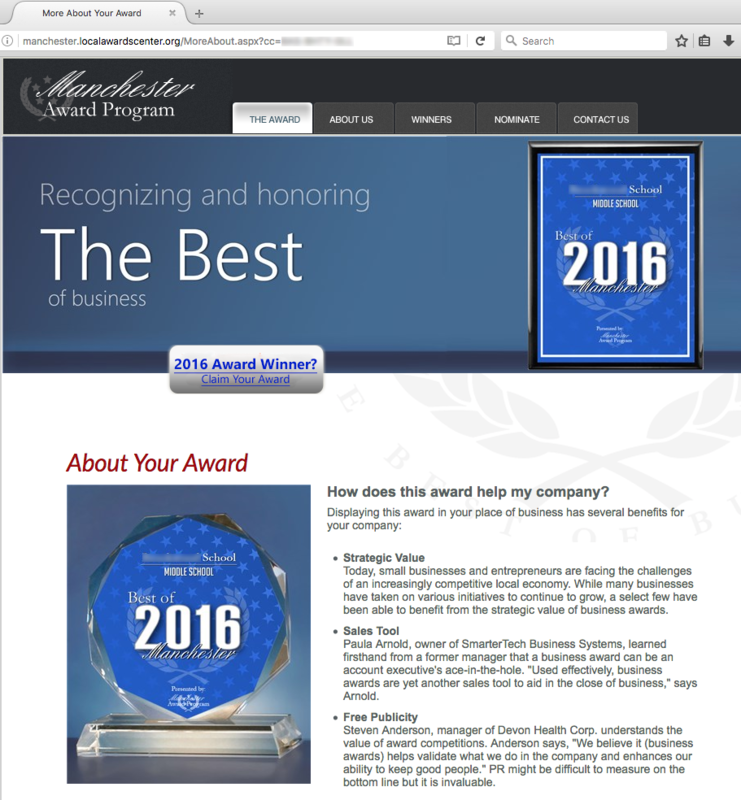 Clicking the link in either email triggers a redirect to the website manchesterbythesea.localawardscenter.org and a “More About” page titled “Recognizing and Honoring the Best of Business.” The web page very cleverly has graphics that seem to cite the school as “Best of 2016” even though the web page describes how awards can help a business, not a school. 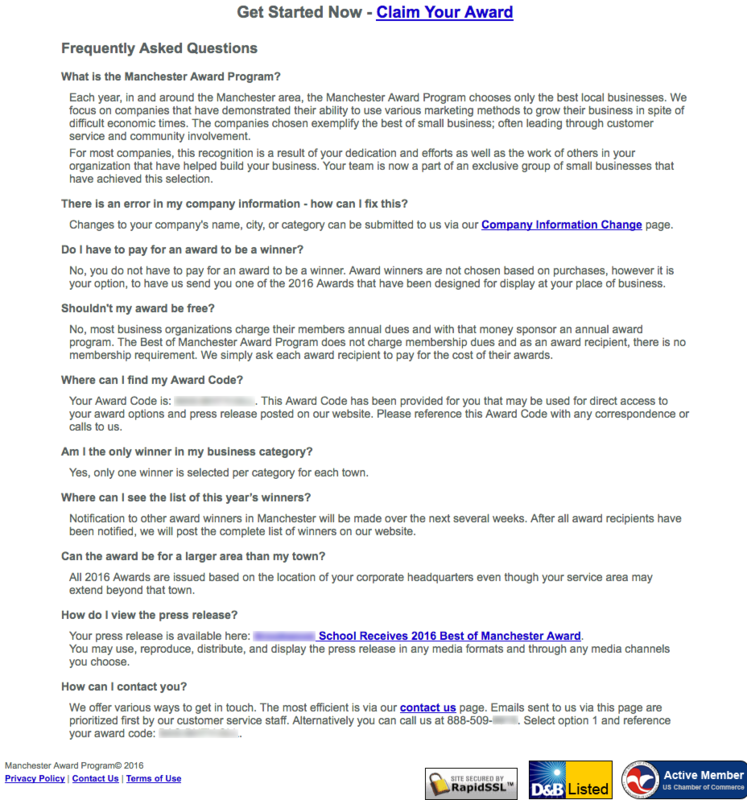 There is even a “Frequently Asked Questions” page to address many common questions such as “Do I have to pay for an award to be a winner?” and “Shouldn’t my award be free?” And, of course, you’ll see the big link at the top for “Claim Your Award.” If you read the answer to the question “What is the Manchester Award Program?” you’ll notice that it is quite general and business-centered. They don’t list detailed criteria how award recipients are selected… “For most companies, this recognition is a result of your dedication and efforts as well as the work of others in your organization that have helped build your business.” Sound like a school award? And now that the school has been notified that they were selected for this most prestigious award, the school is encouraged to purchase one of several plaques to commemorate their selection, at a cost ranging from $149.99 to $229.98, so they can tell the world that they have been honored! Who is behind this wonderful recognition and the domain localawardscenter.org? This is where it gets really interesting from our perspective. A WHOIS lookup of localawardscenter.org informs us that the domain was registered by a Mr. Tim O’Reilly from Houston, Texas on August 22, 2016 and representing an organization called “Local Awards Center.” But what about the domains the awarding emails were sent from? A WHOIS lookup for system-award.com and localawardi.com reveal that they were both registered to a Mr. John Jordan from Berwyn, Pennsylvania on November 6, 2016. Each of the new award emails said “If you would like to stop receiving advertisements please write to: Business Recognition, 337 Garden Oaks Blvd, Houston, TX 77018.” When we conduct a search for this organization and address we only find a debt collection agency at this address. If we put quotes around “Business Recognition” to force that search, all we find are emails to other businesses informing them of their award. Does any of this sound legitimate to you? So, dear reader, caveat emptor…. 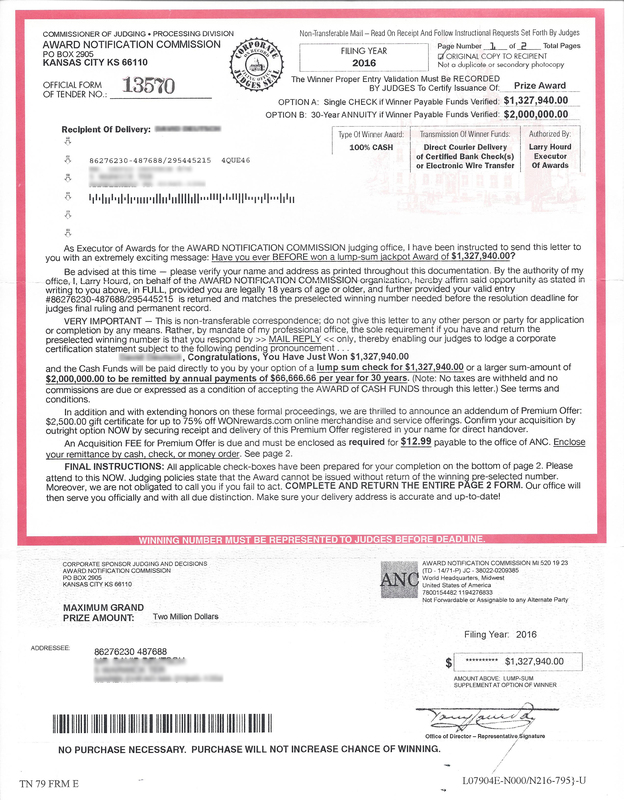 Many would describe these sophisticated award mills or notification commissions as nothing more than scams designed to separate you from your hard-earned dollars.